Bethel Mennonite Church, Winnipeg, MB, 1991-present.. 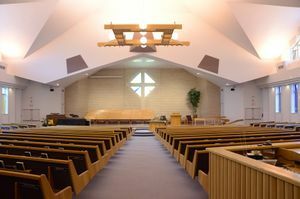 Interior of the Bethel Mennonite Church, Winnipeg, MB, 1991-present. Source: Harold Funk Architect Inc. The St. Demetrios, Romanian Orthodox Church, Winnipeg, MB. Source: Picture This: My World in Pictures. Bethel Mennonite Church, Winnipeg, MB. Bethel began in January 1938 when Benjamin Ewert, a minister ordained by the Bergthaler Mennonite Church, was commissioned by the Canadian Conference of Mennonites to visit Mennonite families and settlements in Western Canada. In Winnipeg, he gathered a group of 21 interested individuals and held services in the Emmanual Baptist Church at Sargent Avenue and Furby Street. Later that year, they rented a church at the corner of Sherbrook Street and Sargent Avenue and held services there for the next six years. In 1945, new facilities were needed and the congregation purchased a church at 103 Furby Street (Furby and Westminster). In 1953, its membership included many Mennonite students and young people who came to the city for employment. Most of the services in 1953 were in English, with a German and an English sermon every Sunday morning. From 1947 to 1949 the Canadian Mennonite Bible College was located in the basement of this church. In 1955, property was acquired and a new church built at the corner of Stafford Street and Carter Avenue. An education wing was added to this facility in 1962. Due to continued growth, a new church was built on this same location in 1991. The old sanctuary was converted into a dining hall with a large new kitchen, while the education wing was demolished to make way for the new church sanctuary. Due to increased membership, three daughter churches were started over the years. 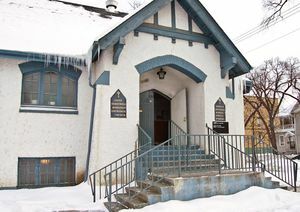 Elmwood Mennonite Church was the first daughter church, established in 1961 in the Elmwood area of Winnipeg. It later relocated to Burrows and became known as Burrows Bethel Mennonite Church. It dissolved in 1997. 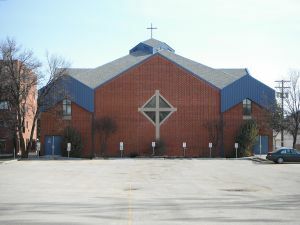 The second daughter church was established in 1963, when members from the Charleswood area of Winnipeg began meeting in Chapman School. 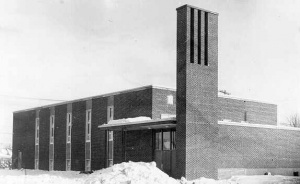 They became known as Charleswood Mennonite Church, building their own church in 1965. Hope Mennonite Church was started in 1987 by seven Bethel members commissioned to start a new congregation. They met in several temporary locations until settling in at 222 Furby Street, sharing space with Young United Church. The congregation changed its name several times. It was originally known as Winnipeg Mission (1938), Bethel Mission Church (1939/40), Bethel Mission Mennonite Church (1946) and finally Bethel Mennonite Church (1957). In November 2012, Bethel Mennonite Church celebrated its 75th Anniversary with a celebration weekend. It included a history bus tour, the planting of a peace pole, a special quilted wall mural depicting Mennonite and specifically Bethel’s history, a 45-minute documentary DVD of Bethel’s 75 years of history, an evening of panelists discussing the historical conscientious objector status and peace stance, a plaque naming all Bethel’s conscientious objectors, and a musical afternoon reviewing songs of Bethel over the years. Canadian Mennonite (4 December 1953): 43; (30 December 1955): 3; (20 May 1960): 11. Dyck, Betty, ed. Bethel: Pioneering in Faith, 1937-1987. 1988. 147 pp. Dyck, Harry B. "The History and Development of the Bethel Mennonite Church," Research paper, CMBC, 1965, 26 pp. Mennonite Heritage Centre. Enns, Edward. "Bethel Mission Mennonite Church," Research paper, CMBC, 1950, 22 pp. Mennonite Heritage Centre. Mennonite Reporter (15 April 1991): 11. Petkau, Evelyn Rempel. "Bethel Mennonite Church Celebrates 75 Years." Canadian Mennonite (7 January 2013). Web. http://www.canadianmennonite.org/articles/bethel-mennonite-church-celebrates-75-years. Unpublished congregational history, 1965, 16 pp. Mennonite Heritage Centre. Copied by permission of Herald Press, Harrisonburg, Virginia, from Mennonite Encyclopedia, Vol. 1, p. 314. All rights reserved. Friesen, Pam. "Bethel Mennonite Church (Winnipeg, Manitoba, Canada)." Global Anabaptist Mennonite Encyclopedia Online. February 2014. Web. 19 Apr 2019. http://gameo.org/index.php?title=Bethel_Mennonite_Church_(Winnipeg,_Manitoba,_Canada)&oldid=154201. Friesen, Pam. (February 2014). Bethel Mennonite Church (Winnipeg, Manitoba, Canada). Global Anabaptist Mennonite Encyclopedia Online. Retrieved 19 April 2019, from http://gameo.org/index.php?title=Bethel_Mennonite_Church_(Winnipeg,_Manitoba,_Canada)&oldid=154201. This page was last modified on 1 September 2017, at 00:44.